That Israel is aligned with the people I most despise forces me to recognize that Jews are at best tolerated, mostly unwanted by pretty much everyone–except that is, Christian evangelicals who voice support for their own misguided and nefarious reasons. I’d like to deny it, but I know my destiny is linked to the survival of Israel. When an El El 747 touches down at Ben Gurion Airport, the tradition is for the cabin to be filled with the plaintive, mournful sound of the Israeli national anthem. Even, nyceve, a very assimilated American Jew, sheds a tear or two when I hear that music and I am reminded of our terrible history. But Jews do have Israel, a strong (nuclear-armed) state supported by a superpower. They are well and truly safe there, a safety that no Katyusha or suicide bomber can really threaten – those are the tools of fear alone and the Jews have long ago learned that fear can be overcome. I wish the American public faced the fear of terrorism with half the composure that Israelis do – we might be sacrificing fewer of our own society’s basic principles of liberty were it so. Muslims in the middle east have nothing like Israel. Ordinary muslims are always caught between terrorists, tyrants, mullahs, and madmen, and now – the wrath of Israel as well. Lebanese people, who have no control over Hizbollah, who have just escaped decades of civil war, and only recently in the Cedar Revolution thrown off the yoke of Syrian dominance and seized their destinies for themselves – are being killed. Why? I hope it gets the attention it deserves. You raise some extremely important issues. I really dont want you to feel I am attacking you at all. I cant express how hesitant I am nowadays. It seems like every sentence – no matter how carefully crafted, only delivers pain. You really eased my mind a bit with your comment – thank you. Bloodthirsty Children or Media Missiles (Michael Shaw, “Bag News Notes”); Emily Litella Speaks Out on the Situation in the Middle East (Jonathan Schwarz, “A tiny revolution”) — The photo on the right is among a series by several news agencies taken near an artillery position in the northern Israeli town of Kiryat Shamona. (A Guardian reporter writes about the circumstances here. *) The two posts address its implications in different ways. …Sadly, until the Arabs let go of their culture of incitement and rage, I’m afraid there’s no concession Israel can ever make that will bring peace with these people. 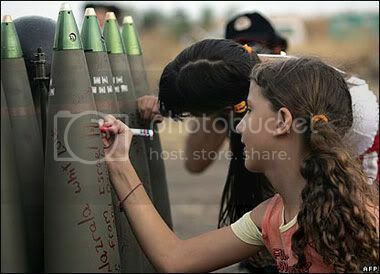 Those aren’t Lebanese girls writing on Hezbollah rockets, but Israeli girls writing on Israeli shells? As I wrote at Bag News Notes, there is (or was, it’s been a while since I’ve looked) a frequent feature on the right wing Little Green Footballs (LGF) blog site called “Palestinian child abuse.” It involves showing photos — and, sadly, authentic ones — of West Bank, Gaza, etc. kids dressed in suicide bomber mockups, or in military garb, etc. I think Schwarz was simply pointing out that the impulse to indoctrinate kids with hatred and/or use them for propaganda purposes is not as one-sided as sites like LGF imply. The bomb them free crowd has made the work of liberalizing the Middle East much harder than it needed to be. * Pointed out by Nell Lancaster in a comment at Bag News Notes. Why are the cold-blooded murders of these people seen by so many as fitting revenge of the weak? Why is this young, good looking, physically strong and economically secure kid perceived as being more desperate than a 67 year old economics lecturer making his way in the soft early morning light to his dead end job as a guard in a car park? Gil Shterzer (“Israeli Guy”) posts a devastating photo of two victims of the attack. I think one victim in the photo is Mr. Ostinsky, the car park guard. It’s hard to disagree with Imshin’s (apparent) support for the security wall, or Gil Shterzer’s angry call to “waste” Hamas leaders like Abdel Aziz al-Rantissi or Mahmoud Al-Zahaar in retaliation. May be easier said than done, though. I continue to support ending the West Bank/Gaza settlements, and think the “road map” or the Nusseibeh/Ayalon agreement could be ways out of the conflict. But I read (via Imshin) that Arafat is insisting on “right of return” again, which together with non-stop suicide bombings makes either peace plan seem like it should be in your bookstore’s “fantasy” section. What does Abu Mazen say? If that matters. Meanwhile, consider helping Israeli terror victims by supporting NAVAH. Weapons mess deconstruction, or Who needs fools to rush in when I can do it myself? Once upon a time, a long, long time ago — well, in November 1998– the London Sunday Times printed a report* titled “Israel Developing an Ethno-Bomb,” by former Israeli intelligence officer Uzi Mahnaimi and war correspondent Marie Colvin. The report claimed that researchers at an institute in Nes Tziyona — “the main research facility for Israel’s clandestine arsenal of chemical and biological weapons” — were attempting to develop deadly micro-organisms that would attack only people with distinctive genes carried by some Arabs. I’m not qualified to assess whether such a weapon could be successfully developed. *** I merely point out that this report features a number of people — reporters, politicians, scientists — who were or seemed respected, knowledgeable, Jewish, or combinations thereof, and who said the idea was conceivable and/or that Israelis were researching it. In addition to the reporters, the report features Knesset member Dedi Zucker and former Defense Secretary William Cohen (quoted on feasibility only; Israel’s pursuits were raised by a second anonymous defense official). That doesn’t mean they were right, of course. I imagine Mahnaimi and Zucker — now an ex-Knesset member who has left the Meretz party to form an Israeli Green Party — may be dismissed as the usual “Peace Now” suspects by many, and perhaps even their non-self-hating-Jewishness will be in question for some. Dedi Zucker, a member of knesset [sic], the Israeli parliament, denounced the research yesterday. “Morally, based on our history, and our tradition and our experience, such a weapon is monstrous and should be denied,” he said. At first glance, Zucker’s statement seems to corroborate the report (although “denied” is an odd choice of words). But on re-reading the article, I think he’s just reacting to it. I’m trying to reach Mr. Zucker about this. It’s possible that Mr. Zucker had some knowledge about Israeli research via his participation in the Knesset’s “Committee for Scientific and Technological Research and Development.” The committee concerns itself with research institutes, but probably not with military research, which I’d guess is overseen by a different committee. On the other hand, although (admittedly) judging by a Google search, Mr. Zucker’s interests have seemed to lie elsewhere over the years. Second, the Times story quotes a South African scientist named Goosen; he’s popped up again recently in a Washington Post story about black-market bioweapons, so that I’m provisionally tagging him with my “shady?” and “joker?” mental magic markers. So what’s this all about? Only that it seems to me that Mr. Aziz Poonawalla had a reasonably good faith basis for believing such weapons were being developed — especially because he relied on the WiredNews abridged version of the story, where Mr. Zucker’s comment seems quite authoritative, at least to non-Israelis. Aziz stumbled into a hornet’s nest of anti-Semitism charges of “blood libel” and the like for daring to repeat the story. ** Given the Times article itself, I’d say that’s not justified unless you also level the charge at Mahnaimi, Zucker, and possibly Secretary Cohen as well. *** Furthermore, although I’m not Jewish, nothing I’ve ever seen by Aziz justifies the charge. One objection commonly raised about the story is that you couldn’t keep such a weapon from affecting the many citizens of your own country who have “enemy” ancestry to one degree or another. That seems easy to counter. You somehow (1) tailor a disease virus or bacterium like smallpox or anthrax to be more lethal or contagious for people with a given genetic makeup. That’s the hard part, of course. You then also (2) vaccinate your population, perhaps especially the susceptible members, against the disease. Step (1) wouldn’t necessarily make existing vaccines useless; at any rate, you might also develop a custom vaccine. The motive for tailored bioweapons-plus-vaccination over regular bioweapons-plus-vaccination would be to limit the “collateral damage” outside the vaccinated population, and inside it as well if the vaccine were known or suspected to not be completely effective. Here’s something we may all agree on, though: I’d certainly prefer to believe that Israel would not even research such a weapon. The sheer volume of angry reactions to merely reviving the suggestion tells me it would be tremendously controversial among Israelis, and among Jews around the world. Look at it this way: either Mahnaimi and Colvin were right, or they weren’t. If it ever turns out they were right, shame on the Israelis responsible. If they lied or were wrong, shame on them, and the discussion was unnecessary — but it may also have a small deterrent effect of its own. * The story is widely reproduced on the Internet. That doesn’t make it true, but the texts copied seem to match up, so I’m reasonably confident my link is an accurate copy of the Times item itself, for which subscriber access is required. ** As the controversy about Aziz’s post grew, he edited a sentence to read “Israel may be developing” instead of “Israel is developing,” which seemed obvious anyway, but worth stating clearly. *** I found indirect but credible evidence supporting the Cohen part of the London Times report in a very interesting SIPRI report by Malcolm Dando, where footnote 6 reads:‘Cohen warns of new terrors beyond CW’, Jane’s Defence Weekly, 4 June 1997, p. 27; and Starr, B. and Evers, S., ‘Interview: US Secretary of Defense, William Cohen’, Jane’s Defence Weekly, 13 Aug. 1997, p. 32.; I don’t have access to JDW to follow that further. On the subject of Mahnaimi/Colvin items that more or less check out, they also mention that the British Medical Association was to consider the possibility of genetically tailored bioweapons. This seems to be the 1999 BMA report Biotechnology, Weapons & Humanity. The Palestinians said that I [and Clinton] presented our proposals as a diktat, take it or leave it. This is a lie. Everything proposed was open to continued negotiations. They could have raised counter-proposals. But they never did. This partly supports a Palestine Orient House map (via MidEast Web), showing two Israeli wedge-and-corridors through the West Bank: a northern one via Ariel and Shilo and a southern one via Maale Adumim and Shilo. A Israeli-controlled Jordan river corridor connects these two, resulting in at least three major Palestinian West Bank “islands” bounded by relatively narrow Israeli corridors or the Israeli “mainland.” Calling these “bantustans” is only a slight exaggeration (the South African bantustans were a bit more far-flung)– assuming for a moment that the Orient House maps accurately reflect Camp David discussions. As noted, the Morris article suggests they at least got it partly right, by arguably describing the map’s southern corridor. Barak and the Palestine House maps thus seem to agree on one thing: the West Bank was to be gerrymandered, to preserve at least some of the Israeli settlements. The accuracy of descriptions like “razor-thin” (Barak) and “bantustan” (Arafat) is in the eye of the beholder. Given the fluid situation at the summit described by most participants, it’s possible that the two versions of the West Bank refer to two different proposals floated at the summit; of course, it’s also possible one or the other (or both) are inaccurate in its details. But assuming (as I do) that Barak isn’t lying, the offer he described to Morris would have further subdivided a Palestine already split between the West Bank and Gaza — and preserved a string of galling settlements through the center of the West Bank. Well, here is Barak’s word. It may not amount to the “criss-crossed patchwork” I described, but it’s not difficult to understand why Palestinians weren’t overjoyed by the idea. At any rate, I still hope the “People’s Voice” proposal gains support. 4/7: Israel allows a settlement in Palestinian Jerusalem (same story referred to below). 4/8: China blocks North Korea resolution in Security Council. 4/9: Hundreds dead in Congo massacres. …and much, much more, via Daniel Drezner, on Cuba, Belarus, Zimbabwe, etcetera! While we’re on the subject: it turns out that Aziz Poonawalla posted an article (“basic needs and desires of all peoples“) about the Israeli-Palestinian issue on Sunday, too. Aziz argues for a bi-national single state, an even more idealistic solution than the Nusseibeh-Ayalon “People’s Voice” initiative I described. This approach is laid out in detail by a group called the Alternative Palestinian Agenda (APA), whose initiative proposes reconfiguring Israel, the West Bank, and the Gaza Strip as a federal union of three U.S.-state-like regions: 1) majority Jewish areas within pre 1967 Israel, 2) West Bank/Gaza/other majority Arab areas, and 3) Jerusalem. The APA provides maps of “Palestine-Israel” and Jerusalem to illustrate their proposal. There would be a single Senate, Parliament, Supreme Court, currency, and military. A great number of additional details are presented in the APA proposal — all the way to a gun ban and anti-discrimination commissions — but these seem the most critical. This bi-national state solution at least makes the Nusseibeh-Ayalon idea seem attainable and feasible. I won’t pretend to have followed Aziz’ arguments in detail yet, this is more of a “go take a look” post in that respect. My initial reaction is that this plan and proponents like Aziz choose to ignore what the state of Israel means to Israelis, at least as this non-Jew and non-Israeli understands it. That would be Israel as a place apart, as a refuge for Jews and Judaism. This may be wrong on my part, or it may be wrong, on some level, for Israelis to cling to such views at the expense of fresh thinking like the APA initiative..
Be that as it may, I think a single-state solution like the APA’s would be overwhelmingly rejected by Israeli voters. Given the history of Israel, it would seem a surrender of what Israel has come to mean to many of its defenders. That’s no reason to not try — unless the political resources might be better spent elsewhere. I have the feeling Palestinians would reject such a plan by a similar margin, and for similar reasons: they don’t want to be part of a nation, they want to be a nation of their own, period. But I don’t know. I have a couple of other feelings as well, though. The first one is that 9/11 has put Americans and Israelis in a similar psychological boat; Americans can’t be said not to “get it” about terrorism, the existential threat affecting Israeli lives and politics every day. The second is that both the historic American support for Israel and the current expenditure of blood and treasure in Iraq has earned the United States a seat at the Israeli table as a road map to peace is drawn. As I write, “Operation Iraqi Freedom” is knocking down a threat not just to ourselves, but also to Israel, and at real cost and risk to the United States. Americans have thereby earned a deeper right than ever to make demands of Israel: an end to the settlements, serious consideration of the Bush administration “road map,“* and creativity in arriving at an equitable solution, or at least a reasonable cease-fire, for the Israeli-Palestinian conflict. Given the Iraqi defeat, the United States and Israel couldn’t be reasonably thought to be dealing from a position of weakness or as a reward to terrorism/intimidation, a common argument against negotiations. * This speech refers to a prior June 24, 2002 speech. While it emphasized the need for Palestinian reforms and the end of support for terrorism, it also contained language directed at the Israeli government. ** Data via this Jewish Virtual Library discussion. TECH 4/11: In case anyone ever cares: for some reason the automatic permalink for this item remains wrong. Here is the correct permalink. The Palestinian State will be demilitarized and the international community will guarantee its security and independence. …I’m pretty skeptic but I sure wish it will succeed. I signed the petition and if you are an Israeli you can sign as well over here. The point here is not to show that we are nice but to clarify what Israel is willing to compromise on and on what Israel isn’t willing to compromise. Another reason for this campaign is to shake the Israel public out of its numbness. The people here have gloomed into apathy. There’s not much about “Hamifkad Haleumi” on the web; I’ve found you’ll have better luck Googling about this using the words”Nusseibeh Ayalon,” via which I found this highly negative assessment –“Palestinian rights in the document shredder” — by “Electronic Intifada” writer Ali Abunimah. Mr. Abunimah is mainly upset about the agreement to give up the Palestinian right of return to lands under Israeli control, and about the details of the Jerusalem partition. Yehudith Harel of Gush Shalom, an Israeli peace group, makes similar criticisms. As near as I can tell, the plan at least doesn’t repeat the Barak error of presenting the Palestinians with a patchwork territory criss-crossed by Israeli roads and zones. The full withdrawal of settlers seems like a major concession under the circumstances, and compensation is envisioned for Palestinians who lose the right of return. Since this is something the agreement envisions being ratified by the governments of the two peoples, it seems like this is not an abrogation of rights, as Abunimah charges, or an evasion of responsibility, as Harel claims. 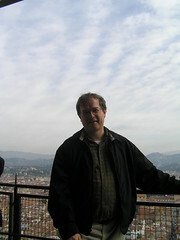 I’m with Mr. Shterzer: I hope this agreement receives support. UPDATE, 4/8: Gil updates the story: Nusseibeh and Ayalon are seeking an endorsement from the Israeli president, Moshe Katsav, according to an item in Ha’aretz. Katsav’s post is largely ceremonial, but it’s still a nice touch. Gil also gently chides me for being a “bit misinformed describing Barak’s offer in Camp David”; see the comments to his post, where I present some evidence — and he rebuts fairly effectively. More on this little historical dispute soon. 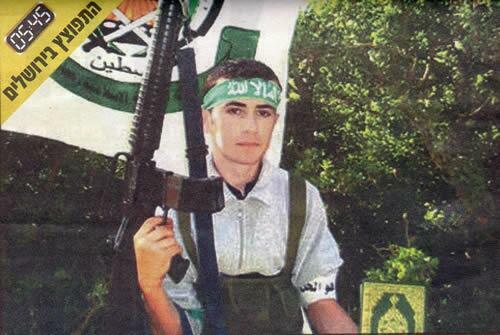 Called to the national forensic institute in Tel Aviv, he was warned to bring Yuval’s dental x-rays so that he would not have to view what the bomb had left of his boy. I’m sure the Palestinians will get the country they deserve, eventually. But every such attack just kicks it further away. I don’t have any illusion that we’ll manage to kill all the terrorists ever. But I sure hope we’ll take care of as many of them as possible. What sets NAVAH apart is that it is usually the first grant that victims of terror receive, enabling them to get the help they need during the first crucial weeks after an attack. In general, most of the victims of terror are ordinary Israelis, with few financial resources.